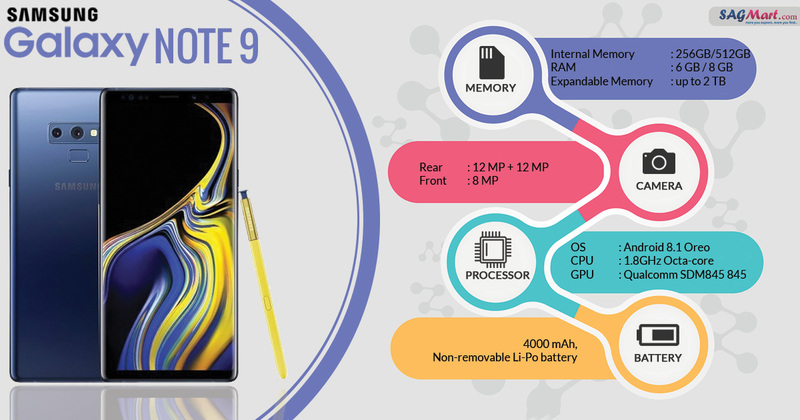 Samsung Galaxy Note 9 smartphone comes with 6.4 inches Super AMOLED Capacitive touchscreen (1440 x 2960 pixels) display. The device runs on the Android 8.1 Oreo Operating System. It powered by an Octa-core (4x2.7 GHz Mongoose M3 & 4x1.8 GHz Cortex-A55), Exynos 9810 Octa processor with 6/8GB RAM and 128/512GB internal storage, expandable up to 512 GB via microSD card. It packs 4000mAh Non-removable Li-ion Battery and 12+12-megapixel dual rear camera and 8-megapixel front side camera. The connectivity options are 4G LTE, Wi-Fi 802.11, a/b/g/n/ac, Bluetooth 5.0, 3.5mm Headphone Jack, A-GPS, and Micro-USB.